Broccoli never tasted so good! 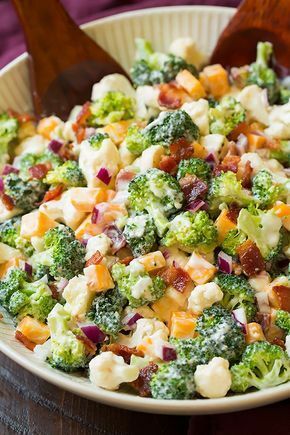 Raw broccoli can be totally boring but when you toss it into a salad with cheese and bacon and cover it with a creamy dressing incredible things just happen! Add all salad ingredients to a salad bowl (I like to set aside about 1/4 of the bacon and red onion to sprinkle over the top at the end for more color, that's totally optional).